Everybody’s talking about Things 3. Now that I’m on the bandwagon, here is my take on what makes it presently the best task manager for macOS and iOS — for me at least. Inevitably this mean comparison with what I turned over along the way. Running pathological optimism means I’ve tried them all, but Todoist got left behind this time round. I’m not here to run that app down, it remains excellent for many reasons — maybe even better in ways that don’t matter to my workflow. But, should you be wondering, is Things 3 better than Todoist, perhaps this will be useful. I‘ve only been using Things 3 for a few months. In truth, I’m generally suspicious of trends, so I tried to avoid it while I still had good reason to. Even if I’m only making excuses, I need more than new and shiny. Thankfully, a genuine reason presented itself when my Todoist subscription was up for renewal. The cost of renewing that sub wasn’t much less than buying the Things 3 suite outright. Between the annually recurrent cost, and various Todoist annoyances, it was worth kicking the tyres. As it turned out, a trial on macOS convinced me to jump. Initially there were two features I missed from Todoist. I’m over them both already. First, the API allowed me to use Zapier, and/or IFTTT for various automations. Second is the natural language parsing for task entry. At least I missed that until I realised it’s either a bonhomie for laziness, or an easy way to fill up a task list with lots of nonsense you’ll never do. Never mind that with a keyboard the difference in keystrokes is minimal. I’m not saying I wouldn’t like to see better natural language support added to Things 3 — it does include some basic date parsing abilities — but it doesn’t come close to being the show stopper I thought it might. If anything, the relative slowdown — minimal as it is — helps add a little more deliberation into the process. To the first point, with native automation Cultured Code has made significant inroads to mitigate some of the abilities lost by not having an API. By all accounts, the recent addition of a deep, and flexible URL scheme is just the beginning, with other innovations on the way.I would argue that inter-app automation is not just as useful, but in some ways more relevant. The automation I used most would automatically copy editorial tasks to Trello. I was able to create an analogue of that on iOS, using Workflow. Anyone who complains about the ‘extra step’ of pushing a button could look out the window once in a while. Native inter-app automation breaks dependence on the web. In the process it cuts back the surface area of data-sharing with third-parties. More than that, there is an immediacy to working locally that allows for sharing rich data. Being able to delineate notes, mind maps, or outlines into actions opens up all kinds of possibility for continuity. Particularly for a writing workflow. This makes a lot of sense for academic work, research, and writing. Or for any other kind of work that includes creative planning. It’s true the barrier to entry for URL based automation is a little higher than web automation. It’s not that it’s difficult to grasp, more that building the links themselves can be tedious. Cultured Code appear wise to this, having created a link building tool on their website. With nothing left to miss, one can enjoy all the benefits delivered by clever design choices, and opinionated simplicity. Ironically, my biggest concern over both those features was the possibility for double handling and time wasting. And yet, Things 3 is both an app I would rather spend time using, and one I don’t have to. While these new automation features are getting all the attention right now, it’s a couple of subtle, but significant design choices that make Things 3 so effective. I found the flexibility of Todoist equal parts powerful and beguiling. Getting the most from it requires one to configure projects, labels, and priorities to facilitate query filters built around those different pieces of metadata. If you get it right you can contextualise your workload with extremely specific queries. This is a major strength if you need that kind of detail, however, with so much configuring, and fiddling to get it right, it can also be a headache. I never felt like I had it configured very well, so the temptation to reconfigure always hovered. Things 3 is completely different. I'm not going to run through all of its features, there are better places for that. For my money, what makes Things 3 worth recommending is a couple of subtleties that mean I spend less time managing my task list. The first touch is indicative of the user experience in general. The way Things 3 handles the inbox. Processing is simple, a task only requires one touch for removal from view. 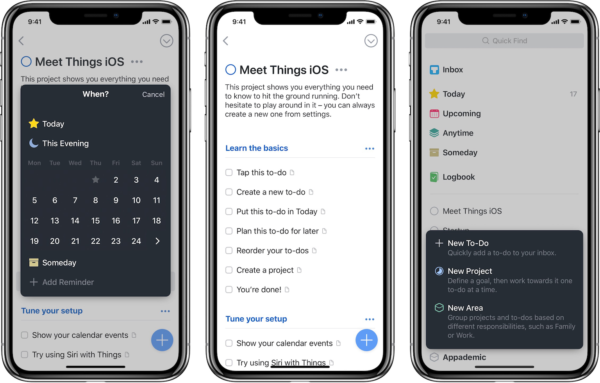 If all you ever want to do is put due dates on your tasks, Things 3 will consider them processed and essentially remove them from view, until the day they require actioning. If you’re wired to slowly disintegrate when faced with growing clutter, this is priceless. Most task mangers have some kind of filtered view to show you only the tasks you need to see, but they all require a lot more interaction. 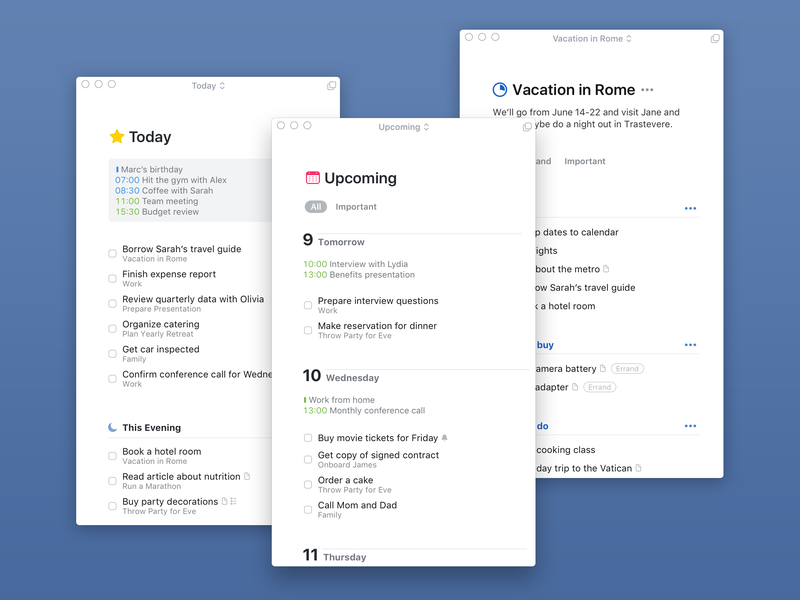 Things 3 is designed to cut back on over-processing by making it extremely simple to get a hold on what needs doing. In that way it’s the opposite of Todoist, but that doesn’t mean it is without flexibility. The emphasis in the Things 3 user experience is on aesthetics. As a method for task management, it leans on visual organisation. Elements like headings, tags, and manual ordering, can be employed in the myriad ways. They can even constitute productivity systems favoured by nerds. On the flipside, Things offers enough customisation to avoid forcing users into an inflexible, or totalising system. Configuration requires little fuss if simplicity is your thing. Or, the various organisational delimiters apply to whatever bespoke version of getting things done you run with. With this app being written about so much, I might surprised to have hardly seen security mentioned, if it weren’t for the fact this is an area that very little light is shined on in general with task managers. Given I was using Todoist, it would be a little rich to take Things 3 to task over security holes. I would argue that Todoist does the minimum required for data security; they could do more. While the mechanics are similar, it's a fact that Things 3 is better than Todoist on security. Cultured Code use better encryption, and provide better insight into what they are doing. Nonetheless, the proprietary syncing would be dramatically improved with client side encryption. From a personal point of view — and this was the same stance I had with Todoist — should anyone hack them, my own task list would not be the most exciting or revelatory reading. Unfortunately, in taking this stance I’m part of the problem, as it overlooks the importance of data security in general. Users so commonly make these kinds of compromises, we excuse developers from making improvements. Who can blame them for focusing on the squeeky door? A little more noise would go a long way to ensuring security standards are improved more generally. Cultured Code suggests they may add client side encryption ‘at a later time’, I would add that it is on users to ensure they do that by making clear it is necessary. This remains an opportunity for them, especially considering the OmniGroup are setting the standard for end-to-end encryption in their software. Which means, if you cannot afford to compromise on security at all, I would recommend using OmniFocus. 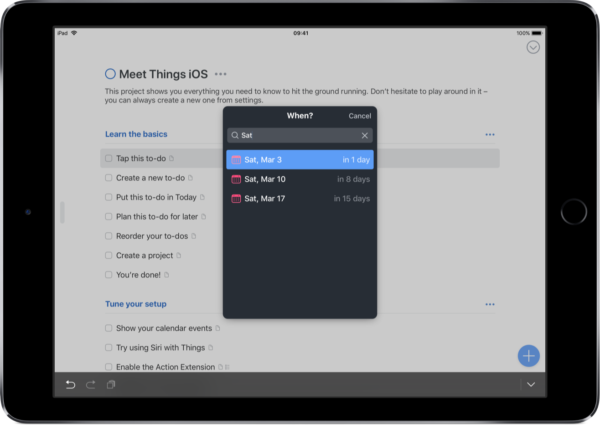 With all the changes coming this year, OmniFocus is worth keeping an eye on. Should they drastically improve the user experience, the security factor will have me sorely tempted to jump again. In the meantime, if you’re using Things 3, know that your data is pretty secure, but not that secure. Is Things the best Task Manager for macOS and iOS? That seems to be the question everyone wants answered, but changing your task manager for the sake of it is madness. Unless it’s your hobby, in which case I can’t help you. 1 If you have something that is working well for you nEverybody’s talking about Things 3. Now that I’m on the bandwagon, here is my take on what makes it presently the best task manager for macOS and iOSow, I’m an advocate for the ‘ain’t broke, don’t fix it’ adage. On the other hand, if you’re struggling with an unnecessarily complex setup, or software that ends up being another thing to manage, you could do a lot worse than give Things 3 a look. It is being talked about with good reason. 2 If you have never used a task manager before, choosing the right one can be confusing, but I wouldn’t hesitate to recommend this to new users. For my own purposes, right now Things 3 is the best task manager for macOS and iOS. While not perfect by any means, it manages to walk the fine line between simplicity, and customisation. 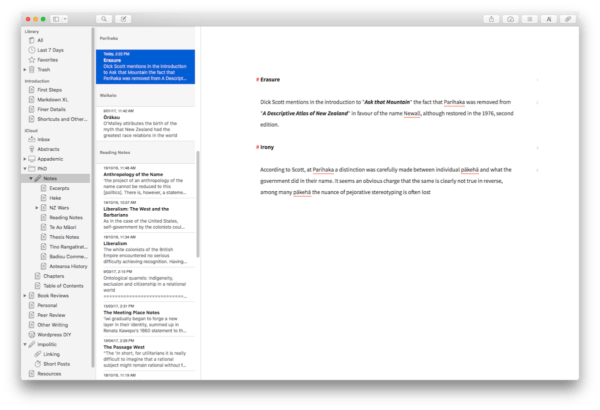 Again, my aim is not to deride Todoist, nothing has stopped it bearing the standard for cross platform support, collaboration, and web automation. But, if you’re already half way out the door, in many ways I have found Things 3 better than Todoist. For macOS users, a free trial for Things 3 is available, or you can pick it up on the Mac App Store. Unfortunately, the iOS app is not universal, so you do have to buy seperate apps for iPhone and iPad. Although, that does mean if you want to try it out on iOS without going all in, you can purchase the cheaper iPhone version to get started. Another link from MacStories. Now that the dust has settled on their annual iOS review, it is good to see a return to this more detailed, useful content. If you haven’t come across this regular series, iPad Diaries. Go back through some of the old posts, there are some great tips for working exclusively on the iPad. Some of them will be a little dated since iOS 11. But with all the little automations and workarounds to sift through, you are bound to find some good ideas for working smarter on that slab of glass. Be warned though, you might end up cycling through a lot of different apps. Students with a penchant for procrastination are particularly vulnerable. Talk to anyone who knows anything about the software economy and you will soon find out this is a strange time. Developers are trying to find ways to stay afloat, while coping with a user base conditioned by the so-called freemuim model. I know a lot of normally rational and generous people who balk at paying for software. I have been there myself. There are some legitimate historical reasons for that, it would be easy to implicate some of the biggest software names in the stratification between obscene rents for virtual necessities, and the meagre sums people will pay for the lesser known. These days I feel I have a better grip on the cognitive dissonance between stumping a fiver for a coffee and paying a fairer price for apps. For example, making music on the iPad allows me to purchase incredibly powerful apps that cost a fraction of the price demanded by their desktop counterparts, let alone purchasing the equivalent hardware. And yet, I still know folks who will wince at paying $10 for an app that took a developer years to make, despite this massive difference in cost versus utility from desktop to mobile devices. I can’t imagine how disheartening this must be for the people who make such apps. While I am primarily referring to iPhone and iPad apps, if you will excuse the pun, these developments have had a tangible impact on the Mac App situation too. Apple hasn’t done much at all to mitigate the difficulties facing developers – something all but the most benighted of Apple fans have started to acknowledge – especially given the 30% tax they claim for access to their walled garden. For independent developers, the situation can be pretty dire. Which is why, along with some of the reasons above, and more besides, I feel relatively positive about the service offered by Settapp. To my mind, the collective nature of it makes sense – just as the single license model of old is unsustainable, so tool is the idea of having an individual subscription to every single app you use. 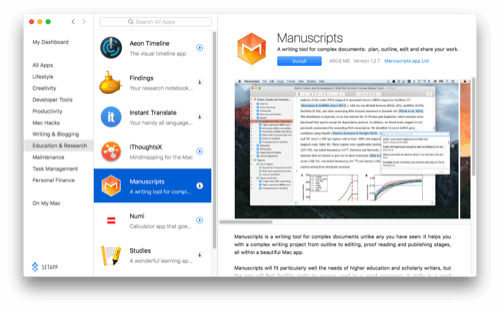 Setapp already has some of the best apps available on Mac, including numerous education and research focused tools. 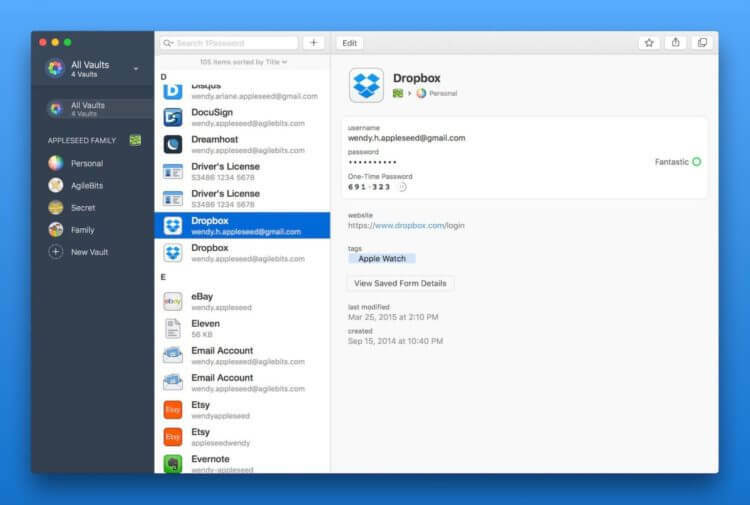 I have already mentioned a number of the apps available on Settapp. Many of them are available for purchase individually on the App Store, and for a lot of people that may well remain the best option if you only need the likes of Marked, Uylsses or Taskpaper. On the other hand, a Settapp subscription will give you all of these apps, and a whole lot more for ten US dollars per month. It will also mean you never have to worry about purchasing new versions, or dealing with in-ap purchases for monetised features. As far as students, academics, and other researchers are concerned, Setapp is ideally stocked with a number of apps I would recommend outright. To mention just a few, it includes one of my very favourite writing apps, Uylsses . Both iThoughts and X-Mind are excellent mind mapping tools. Then there is the Findings research notebook, the Studies flash card app, a unique and really promising academic writing app called Manuscripts. Timelines, outliners, task management tools; the list goes on. They are adding to the collection all the time, and better still the service is not loaded with junk. It is an invite only, curated collection; they are banking their reputation on some of the best software available on the Mac. If ever I find myself in one of those tedious Mac versus Windows conversations I need only point to one thing that tips the balance toward the Apple machine, and that is automation. While it is true that automation software is not the exclusive domain of the Mac, Apple’s historical commitment to it has not only lowered the bar for entry to native automation, but has fostered a platform which has seen a slew of wonderful third-party tools that will allow anyone with a little time and determination to dip their toes in the automation waters. Honestly, it is embarrassing to admit the amount of time I might have saved had I have embraced some of these technologies early than I did. 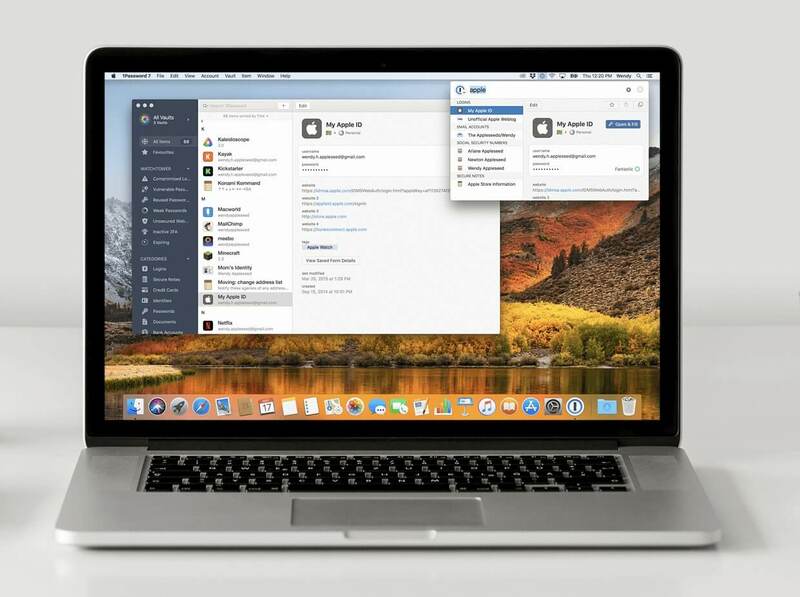 Admittedly, with services like IFTTT and Zapier, automation is becoming less and less platform dependant, but whether you want to go full nerd, or simply save yourself and your fingers from repetitive typing tasks, there is nothing like the Mac for getting started. This will be another post in parts, there are far too many options for Mac automation to throw them all on a page and hope for that to be useful. The intention is to give you some ideas for getting started with this automation racket. Perhaps the easiest area to begin is with text expansion. Limited support for text replacement is available natively in macOS, or you go further with apps like Typinator or aText. My favourite app for the job, and probably the most powerful of the lot, is Text Expander . Start with simple things, like commonly used email addresses, your own personal details, signatures or often repeated phrases. Something I have found particularly useful is converting clumsy English spelling of non-English words and names. For example, my thesis contains a number of Māori words that have macrons for long vowels, Text Expander makes sure I neither forget nor mess up the spellings of those words. Likewise for accented European names like Zupancic to Zupančič. The more you use text expansion, the more you will start to notice commonly used text you can automate, and this is to barely scratch the surface of what a tool like Text Expander can do for you. Smile’s Text Expander Blog is full of examples of how to use snippets in your workflow. One specifically research based use case is to setup snippets for common web searches. For more ideas on how to get started, Zapier have a nice write up on their blog you might like to check out. 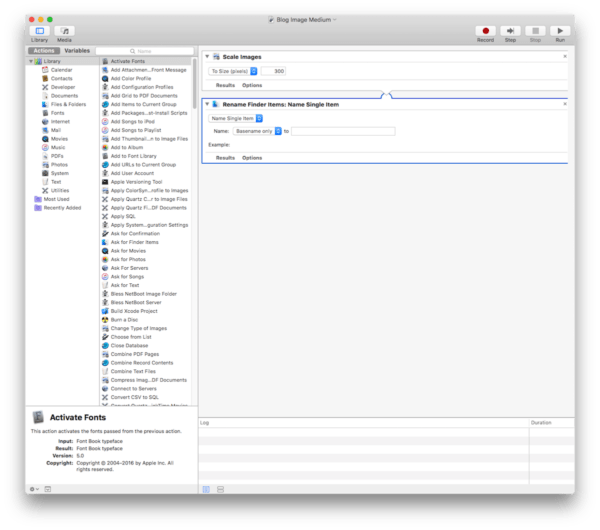 Automator can seem a little daunting at first, and to be fair the user interface is not all that enticing. But, don’t let that stop you from messing around with it. Just as there are many text based tasks that you might not know you can automate, there are many more fiddly and tedious jobs littered throughout most people’s workflows. Academic workflows, in particular, are usually littered with tasks ripe for automation, and this is in no way limited to university work itself. If you are a blogger, an artist, or even a social-media junkie, chances are there is something you do regularly that you can reclaim significant time from. Having said that, like anything the problem is knowing where to start. There are a number of good Automator resources available, but you will never go wrong by starting with Sal Soghoian – the undisputed Jedi Master of Mac automation – at his Mac OS X Automation site. You can even setup Automator do some of your research for you by setting up a feed with keywords and collecting the URLs for the articles it returns. This article has an example of one such workflow, along with a means for downloading images and video, and setting up a native, standalone web application for sites you have to keep open. Something all students and academics have to deal with a constant influx of digital documents. Whether they be absurdly arcane forms, journal articles, ebooks, expense claims, or whatever, they never stop piling up. 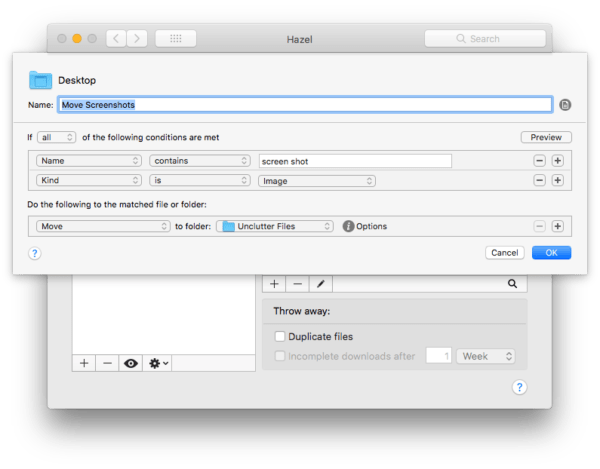 Enter Hazel, put a little time into this thing and you can wipe your hands of repetitive file management and processing tasks. And, it’s not just the mundane and simple jobs either, Hazel can encode media, manage your photo library, add music to iTunes, use pattern matching to rename and file documents based upon their contents, run scripts, take care of your desktop, trash and downloads – in fact, like most good automation, it is more limited by a user’s ability to think of how to use it than by its own features. A little imagination and you can chain all kinds of services together, for example, there are party people who like to trigger their own welcome home soundtracks by using Hazel with Dropbox and IFTTT. The Noodlesoft forum is among the most active developer forums I have come across, and the Hazel user base is full of helpful and proactive people willing to chip in if you get stuck. The forum is also full of inventive Hazel actions that other users willingly share with newbies. Finally, if you are getting stuck and you are the kind of person who likes a visual guide, you can either checkout the innumerable videos on Youtube or David Sparks has a detailed  Video Field Guide available. John Gruber has a nice, concise review of the new iPad pro. Ordinarily I would put this on the links page, but I have been looking for something succinct that might be helpful for anyone weighing up a purchase after last week’s WWDC. For a long time the iPad has been a decent ancillary device for academic work, but my sense is the new form factor and the forthcoming evolution in functionality with iOS 11 will start to make this a serious option as a primary work machine. There is still a way to go with certain apps  , but the iPad has already become an outstanding writing tool, and with this latest iteration it can be considered a serious alternative to a laptop for focused work. This little gem from Brett Terpstra illustrates just one of the ways text expansion can be used. One of my as yet unstated goals with this blog is to hopefully lower the barrier for entry to some of the wonderful, simple automation tools available on the Mac. For anyone dipping their toes in the automation water for the first time, I will often suggest text-expansion as an ideal place to start. 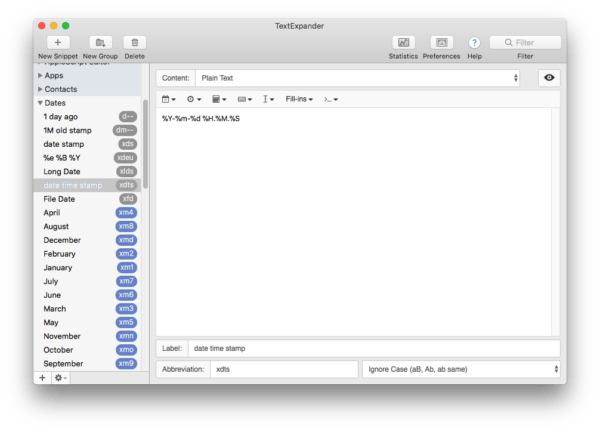 There are numerous utilities available for this, from apps like QuickKey, TypeIt4Me and Typinator to what is considered the gold standard in TextExpander. There is still a lot to say for keeping it old school with note-taking. Handwriting after all is a key tool for comprehension and retention. Although, judging by the wall of glowing Apples one sees in lecture halls these days, that does not appear particularly persuasive with regard to note-taking. Still, this intersection between technological trend and learning technique is, I believe, just one among many things that make the iPad such an excellent device for study. 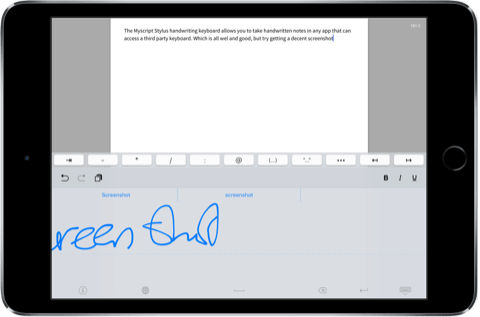 While you can get pretty serious about handwriting on glass with an iPad pro and Apple Pencil, even with the standard model you can benefit from some of the great handwriting apps on iOS. It is true that there are clear advantages to maintaining typewritten notes. Combining lecture notes, PDF annotations and other general research materials into a searchable database is hugely advantageous for both writing and revision. Luckily, none of this necessarily means handwriting should be excluded from a note-taking workflow. The only question is how integrated you want it to be. As ever, there are options. 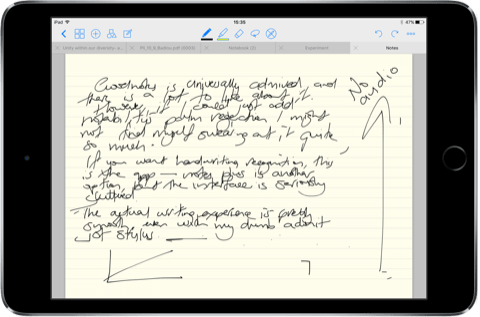 For a lot of people, Goodnotes is the standout app for handwriting on the iPad, and with good reason. Although, it still holds to somewhat dated skeuomorphic design elements, that is a bit of a double-edged sword, as much of the app’s appeal lies with the convincing replication of an analogue writing workflow. Its real killer feature though, is handwriting recognition and text conversion. This means you have the choice between searchable handwritten notes, or converting your handwritten notes to text for use in the app itself, or for export if you keep your notes elsewhere. Possibly the most underrated aspect of Goodnotes is its PDF annotation, which I find to be smoother and more intuitive than any of the myriad specialty PDF apps I have owned and used. 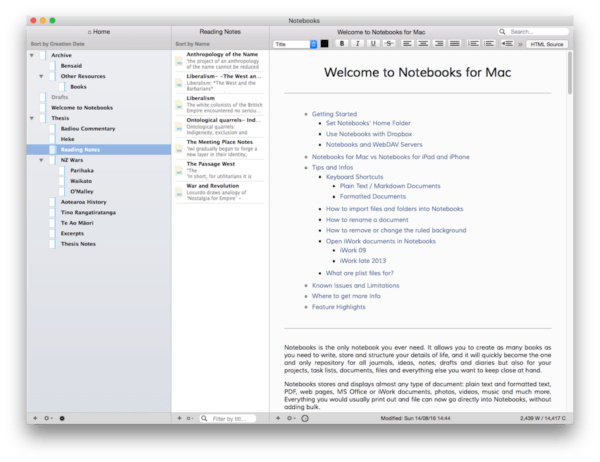 If handwritten notes and document markup are the extent of your workflow, then Goodnotes may even be all you need; especially now that it has a solid macOS companion app. Notability is another sound writing app, although one that comes as something of a tradeoff. 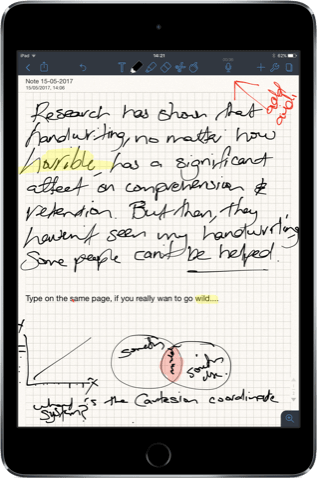 Notability does not have handwriting recognition, so handwritten notes can neither be searched, nor converted to text. Nonetheless, it does have its own marque feature with its ability to capture audio. The appealing simplicity of recording a lecture and taking notes in the same app can account for much of Notability’s popularity among students. Furthermore, Notability is a nicely designed software, and many will find its interface to be much more appealing than other similar apps. Moreover, its palm rejection is frankly much better than Goodnotes, the PDF markup tools are again very good, and its own macOS app is more fully featured and polished. The lack of handwriting recognition is a little disappointing, but you don’t have to go far to find people, students especially, who see audio recording as a more significant feature. Again, there is enough in this app that it may even be the one to rule them all for you. Finally, if you want the cognitive benefits of deliberate long form note-taking, but you don’t care for the end result, there is something of a hack you might like to try. The MyScript Stylus Handwriting Keyboard allows direct, handwritten input into any app that you can use with a third-party keyboard. It hasn’t had any updates for a little while now, but it still works well. In fact, the handwriting recognition is impressive. You can use it as an input device with any text-editor or notes app that allows a third-party keyboard. Notes Plus is very similar to Goodnotes, with even more features. It even has audio recording. I find the interface to be a little too cluttered for my liking, and the user experience can be awkward at times. I suspect these relatively small quirks are what keeps it lagging a little behind Goodnotes in the popularity stakes, as the handwriting recognition engine is excellent. Nebo is renown for handwriting recognition excellence. Underwritten by the my MyScript Ink engine, it has been winning awards and slowly gaining acclaim. The only problem is it requires an Apple Pencil to work, unless you are working on a Surface device that is, then your active pen will do fine. The 2018 iPad is a big deal for bringing Apple Pencil support to the cheaper model. There remain a lot of reasons to upgrade to one of the iPad Pro models, but Apple Pencil support is no longer one of them. However, if you're still rocking an iPad Air, or iPad Mini, you don't have to give up on handwriting altogether. A good old dumb, capacitive stylus can still work better than you might expect. And for marking up PDFs, or drawing the Adonit Mark. This is an ongoing battle, but for some there is a strange kind of jouissance in fiddling with one’s note-taking system. To state the obvious, note-taking is one of the more crucial academic skills. So it would seem there is a certain amount of justification in trying out different solutions to see what might stick. Whether this is new territory or not, there is always the question of where to begin. To drastically oversimplify the matter, the essence of note-taking is twofold: capture and retrieval. Naturally, there is a lot more to doing it well, but if you are just looking to get started then having these two things in mind can only help. If you prefer to type your notes, then there is one simple piece of advice I would happily give anyone. If you don’t already know how, spend the brief amount of time needed to learn how to write in Markdown. Markdown will allow you to embrace plain text, which will not only future proof your work but it will make it as portable as possible and give you a uniquely focused medium for all your writing . In turn you will be free to try different solutions while keeping your work intact, and this barely scratches the surface of Markdown’s usefulness. I am yet to find a satisfactory source that makes a clear and concise account of the benefits in using Markdown for academic work. That is not to say there is nothing written, rather there is nothing I have found that doesn’t either run full geek into the weeds to soon, or treat the reader like an idiot. So here I will be brief. In fact, this is it. If you are willing to take 5–10 minutes and learn how to use a couple of basic tricks , you can free yourself from the clutches of bloated, archaic word processors and proprietary systems – and who knows, you might even start to enjoy writing. If that sounds appealing, have a look at this short tutorial. Armed with Markdown, you can make an informed decision about your note-taking, and even how you approach writing in general. Yes, there are well-known names in this category. But, there is more than enough written about the likes of Evernote, OneNote, and even Apple Notes. Each of them are useful in their own right, but to my mind there are more interesting apps available. One of my favourite apps at the moment is Notebooks. I’m not always a big fan of software that tries to be more than one thing, and to be fair I only use Notebooks in a very specific way for one particular thing, but if I were a smarter, more efficient user I could just cut the tape here. Notebooks is an onion of an app, there are layers upon layers of functionality across macOS and iOS – it is a media rich repository for collecting, organising, searching and syncing any kind of research material you can throw at it. The markdown support is excellent and it even has task management support, which if setup properly for research and document review is kind of ingenious. The iOS version has PDF annotation tools, audio recording and handwriting/sketch support. Give it some thought and you will realise that Notebooks could handle a great many of your study and research needs, no matter what level your are working at. While it is certainly not perfect it is definitely going to be enough for a lot of people. If you are looking for a well-deigned, self-contained solution for note-taking and organising your research, or if you are looking to replace that gaudy green elephant, Notebooks is worth more than a cursory look. It is hard to go past Ulysses as a writing app. Whether you want to use it for note taking, essays, long-form writing, or really any kind of writing you can think of. It is another app that benefits from going all in, the more you add, the more you start to realise its potential. Where Ulysses shines is its ability to organise text, for my own purposes that makes it particularly useful for longer form writing. While I am using Scrivener to write my thesis, Ulysses would be more than up to the job for a text based thesis, such as my own. But, in keeping with the note-taking theme here, Ulysses is an excellent candidate. Admittedly, it doesn’t quite have the feature-set of Notebooks, but its careful and intuitive design on both iOS and macOS will appeal to purists. Ulysses also has hooks in automation, particularly with regards to its Workflow integration on iOS, which opens up all kinds of possibilities for note-taking on iOS. Bear is an intriguing markdown based, notes app. Attractively designed, with a unique tagging system and cross-note linking for database referencing, and feature parity on macOS. It still lacks features ideal for academic use, but it is still new, and in very active development. It has gained a loyal user base quickly, so worth keeping an eye on at least.